Locking Devices Ensure A Positive Locking Grip. Flush Receptacles are face molded of arc resistant urea. Heavy duty, rust resistant yoke. Clamp type terminals. Strip gauge for accurate wiring. 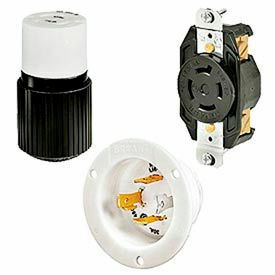 Plugs and Connectors are made using double walled impact and chemical resistant nylon. Internal, self-centering Quad-Gripper cord grip with radius teeth. EPDM dust seal surrounds cord to prevent moisture from entering wire chamber. Duplex Receptacles are made using RTP construction with back and side wiring and clamp-type terminals. Single Receptacles are made of impact and chemical resistant nylon with brass yoke and screw terminals. 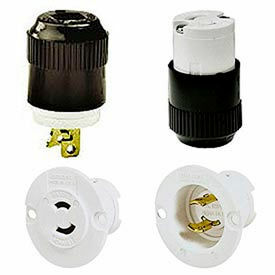 Plugs and Connectors are made using double walled impact and chemical resistant nylon. Internal, self-centering Triple-Gripper cord grip with radius teeth. TPE dust seal surrounds cord to prevent moisture from entering wire chamber. Flush Receptacles are available in impact and chemical resistant nylon or arc resistant urea. Base is molded of reinforced thermoplastic polyester. Clamp type terminals. 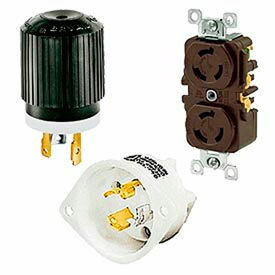 Plugs and Connectors are made using impact and chemical resistant nylon. Internal, self-centering Quad-Gripper cord grip with radius teeth. EPDM dust seal surrounds cord to prevent moisture from entering wire chamber. 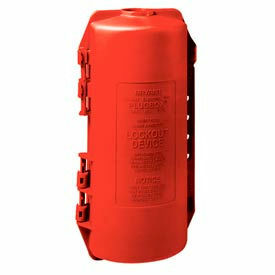 Electrical Plug Lockout Devices Provide An Assured Method Of OSHA Compliance With Lockout And Tagout Regulations. 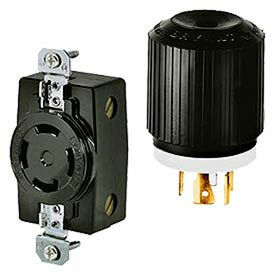 Electrical plug lockout devices protect against unexpected start-up of equipment while maintenance and repair work is performed. Plugs on cord-connected electrical equipment are locked safely in sturdy enclosure. Discourages unauthorized used of tools and equipment. Made using UV stabilized polypropylene housing. High visibility red finish for easy identification. Locking Devices Provide A Positive Locking Grip To Prevent Accidental Unplugging. Made using impact and chemical resistant nylon. 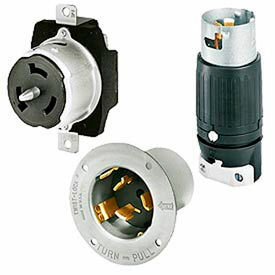 Plugs and Connectors have a stainless steel plug shroud that protects blades to help prevent distortion. Box terminal includes Allen-head screws. Thermoplastic polyester interior for impact strength and heat resistance. 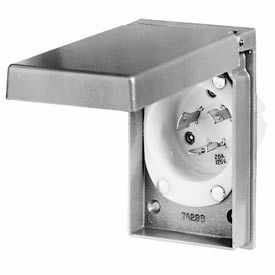 Single Receptacle has heavy duty brass mounting strap and ground system for corrosion resistance. UL listed. CSA certified. Midget Locking Devices Are Built With High Quality Standards That Meet Several National Requirements. Made using impact and chemical resistant nylon with a non-metallic, automatic cord grip. Hand grip features a wide-rib, non-slip design. Individual wire pockets, clamp-type terminals. Dead front construction complies with NEC requirements. Plug face surrounds blades to prevent infiltration of contaminants. EPDM dust seal surrounds cord to prevent moisture and contaminants from entering wire chamber. Tapered cover eliminates snagging. Internal Triple-Gripper™ cord grip provides secure cord retention. UL listed. CSA certified. 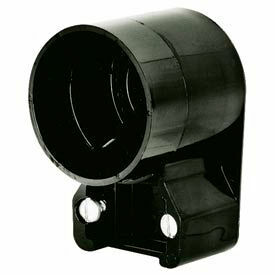 Power Inlet Accessories Protect Inlets From Weather For Safe Outdoor Use. Made using weather protective die cast aluminum plate with gaskets and mounting screws included. Spring loaded, self closing lift cover for safety. Male base is securely riveted to plate. Individual wire pockets with clamp type terminals. High impact nylon terminals. Conforms to NEMA and ANSI standards. UL listed. CSA certified. Flush Receptacles are face molded of impact and chemical resistant nylon. Base is molded of reinforced thermoplastic polyester. Heavy duty molded straps are nickel plated to resist corrosion. Combination back and side wiring with clamp type terminals. 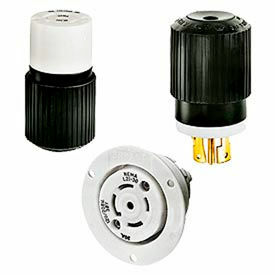 Plugs and Connectors are made using double walled impact and chemical resistant nylon. Internal, self-centering Quad-Gripper cord grip with radius teeth. EPDM dust seal surrounds cord to prevent moisture from entering wire chamber. Bryant® Tech-Spec® Locking Devices Ensure A Positive Locking Grip. Duplex Receptacles are made using RTP construction with back and side wiring and clamp-type terminals. Flush Receptacles are face molded of arc resistant urea. Heavy duty, rust resistant yoke. Clamp type terminals. Strip gauge for accurate wiring. 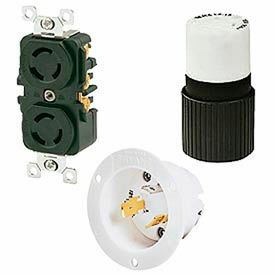 Plugs and Connectors are made using double walled impact and chemical resistant nylon. Internal, self-centering Triple-Gripper cord grip with radius teeth. EPDM dust seal surrounds cord to prevent moisture from entering wire chamber. Adapters Permit wire to Exit Parallel to the Receptacle, Eliminating Space Needed for Wire to Bend. Allows Machinery to be Placed Closer to the wall and Prevents Wire Damage. Angle Adapter Adjusts to permit Proper Positioning of Plug and Connector.